On the 9th of August 1934, The Cornishman recorded the opening of a second, and as it turned out, final enquiry into the proposed St Ives slum clearances. The enquiry and taken place on the previous Thursday, August 2nd, in the Guildhall in St Ives. The enquiry was held at the instigation of the Ministry of Health, and focused on the controversial debate into the clearances proposed for the lower part of the town. This area is referred to in the report as being working class; locally it is still known as “down-a-long” or simply, “downlong”. The Minister of Health at the time was Neville Chamberlain. Amongst the areas cleared was the much missed Capel Court, also known as Pudding Bag Lane and as the locals said; ”In one way and out the same” as it was in effect an old, somewhat cramped courtyard. 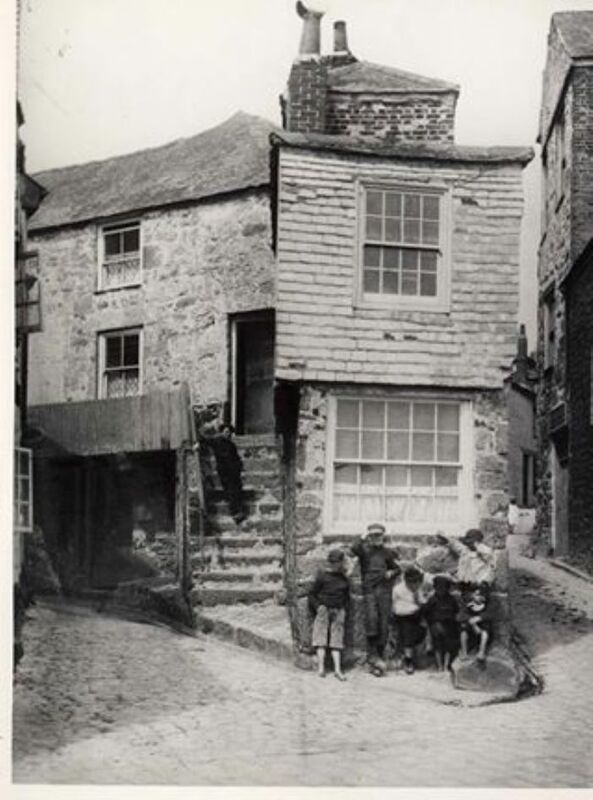 This was situated behind the well-known Sloop Inn and the cleared area, later in 1936 became, at the behest of St Ives Town Council, a car-park. However, this was a central part of the picturesque part of town which was much beloved of artists. Additionally, this area also contained the first meeting place of the first Old Cornwall Society. Robert Morton Nance, the man who did so much to revive the Cornish language, founder of the Cornish Gorseth and who was a leading light of the Old Cornwall Society, was just one of many who were deeply upset by the proposals. As indeed were the occupants of the houses, here and in other streets too, who were eventually forcibly re-housed. The newly-built council houses were to be built at a considerable distance out of the town at Bullan’s Lane and Ayr. The Cornishman article also mentions Dr J.M.Nicholls. He by 1934 had been a G.P. in the town for 49 years. At the time of this inquiry he had been providing annual reports to the Ministry as the Medical Officer of Health in St Ives and had been very concerned for years about the high rate of infant mortality, recognising that in a poor season of fishing, many of his patients were close to starving. Essentially, the State only became appraised of the extent of the poor health of adult males with the massive expansion of military recruitment after 1914. Indeed, this knowledge was a major factor for the introduction of the Ministry of Health at a time when, on average, men were considered fortunate, to live beyond the age of fifty. Dr Nicholls had made frequent criticisms of the standards of housing (cold, damp and overcrowded), the uncovered Stennack river into which all kinds of effluent was pitched, as well as poor quality of plumbing (standpipes were not uncommon). Dr Nicholls was born in Camborne and appears to have had something of the buccaneer about him, using an early motorcycle to tour the large area of his practice. It was a succession of his reports to Ministry on the overcrowding of downlong properties that were, it seems, beyond repair, which led to the enquiry. The Ministry was compelling local authorities to improve the quality of housing stock. The Thirties was actually a good period for house building. The state intervention, however, was done with little or no respect for local feelings in what was a close community. Newlyn, a few years later, learnt from St Ives and mounted a vigorous and successful protective campaign to Westminster led by the fishing boat, The Rosebud PZ87.